This Sunday will not only be my first non-Disney half marathon and first Rock n Roll Half Marathon, but will also be my first race ever running in any sort of costume. With this being a Halloween themed race, I thought it would be fun to try out running in a costume. This costume was first thought of to be used at the Disneyland Half Marathon. However, I had a lot of bad luck in planning a costume to run in for the Disneyland Half Marathon. Every costume idea I could come up with fell flat. I would find parts of a costume but not others. A few ideas didn’t happen because they didn’t have my size. My wife and I had planned on a running in shirts that would have been cool. However, they didn’t have mine in stock. So, when I saw they had the shirt I wanted in my size, I thought that this would make a good first “costume” to run in. Want to know what it is??? As you can see, I don’t have a hat with the Captain America “A” on it. That’s the Disney twist. 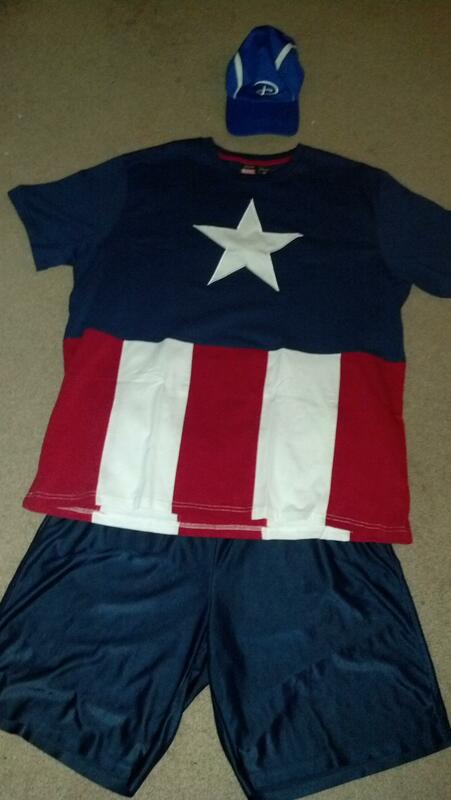 So, I’m choosing to call my costume for the race Captain Disney America. I do have a water wicking shirt that I’ll be wearing underneath this cotton shirt. That was part of my dilemma over this costume. I mean, I still have to be able to run 13.1 miles while wearing it. So, when I first saw this shirt, over the summer, I tested out running with a water wicking shirt underneath one of my cotton shirts during a long run. It worked out fantastic for me. So, I decided it would be okay for a race day. As for the hat. Well, I could have gone with an Atlanta Braves visor. However, since I’m not a Braves fan, I don’t think I’d wear this visor much outside of running in the Captain America costume. I like running in my blue Disney running hat. So, I just decided to go with what I already had. Since Disney owns Marvel, I thought it was okay. However, I’m sure some comic book friends of mine would disapprove. Oh well. This is my first attempt. I’m completing the costume with my new running shoes. Well, new to me. 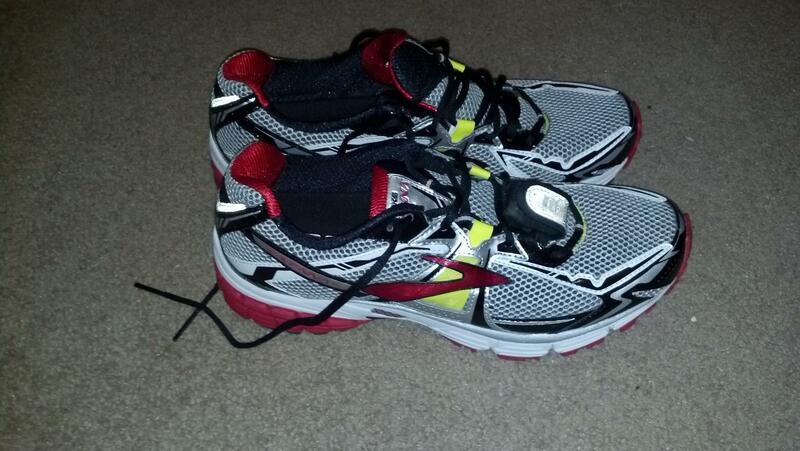 I’ve been running in the Brooks Ravenna 4 shoes since shortly before my Disneyland Half Marathon training began. I LOVED these shoes. So, as I’ve come to the end of the life of those first real running shoes, I just decided to go with what I know works. I’m still very new to running and not ready to venture out to new brands or models of shoes yet. I’ve been running in the newer Ravenna’s this week and it’s been like running in heaven on earth! Unfortunately, there will be no shield. I know that Captain America without his shield seems wrong to fans of the Captain. However, the idea of carrying around a shield for 13.1 miles is more than I care to deal with. Plus, I am trying to race this half marathon for time. So, the less I have to deal with in the costume, the better my focus will be on finishing faster than I have before. So, that’s my “costume” for the race and my first one ever. We will see how it all goes. At the very least, it will be fun! Rock n Roll Los Angeles Half Marathon is this SUNDAY! Rockin Week 8 to a Half Marathon PR! Good luck on your RNR Half Marathon! I will be in the area as I am going to the Women’s Expo today at the Convention Center. If I see runner’s, I’ll be sure to cheer!! Thanks for the well wishes! I had an amazing race! I saw that there was a Women’s Expo at the Los Angeles Conention Center when I went to the RnR LA Half Expo on Saturday. There were a few expos going on last weekend. Hope you had fun at yours! I 100% approve of your Disney hat! (However, I would not have approved of the Braves visor…haha kidding!) Love your costume, hope you have a great race!! Thanks for the approval of the Disney hat. I had to laugh at the disapproval of the Braves visor. When I lived in Nashville, I couldn’t stand the Braves fans. That was another reason I couldn’t bring myself to actually purchase any Braves oriented merch. The costume worked out fantastic and I had so much fun wearing a costume that I’ll have to do it again. 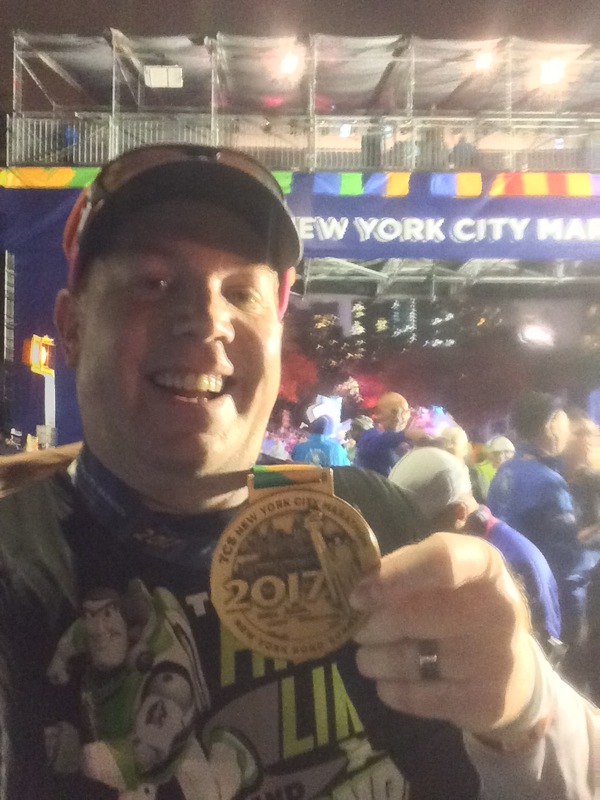 I’ve already got some ideas about WDW Marathon weekend.